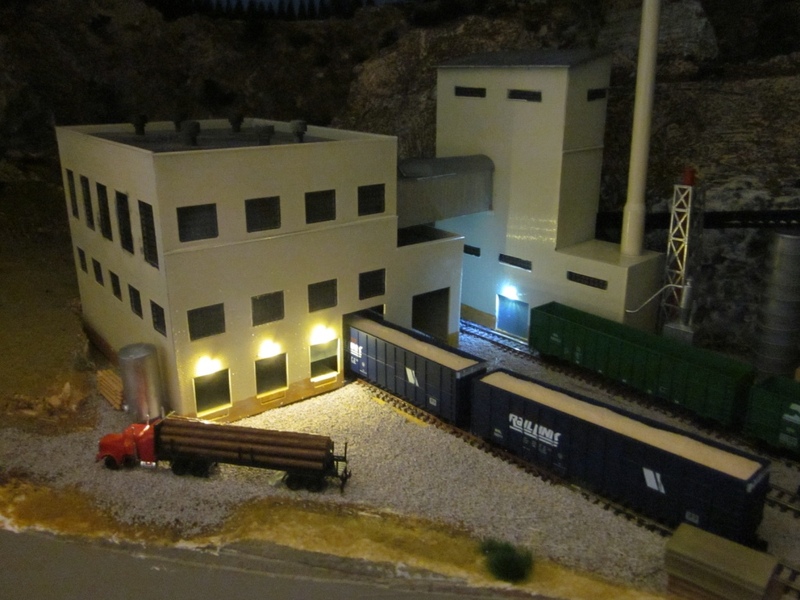 This article will describe how you can build Industrial Lights for your layout for less than 50 cents. 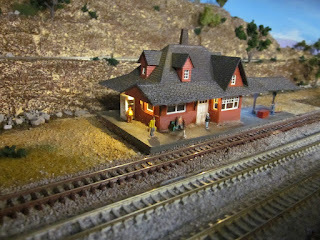 Here is an example of my first attempt installed on my N Scale layout. 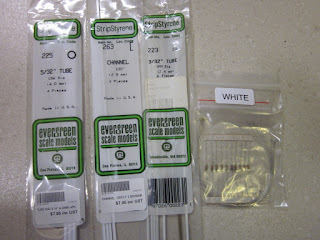 Some background first: I have been buying small LEDs from various suppliers for some time and using them in buildings. 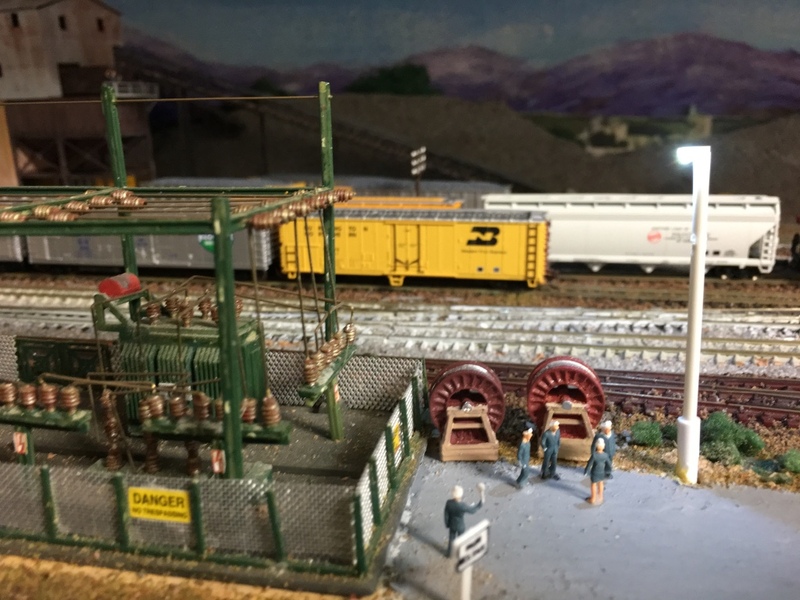 There are several commercial model railroad suppliers who wire them with all the circuitry so you can run them on DC or AC from 3-16 volts. They are excellent but work out about US$3 each light. 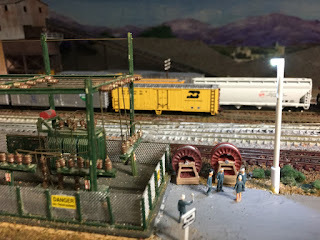 Then on a layout tour at the latest NMRA convention in Indianapolis I saw a layout with building lights that were as effective as anything I had seen to date. The owner used wired SMD LEDs which he bought of “EBay”. That evening I ordered about 50 of them in warm white and bright white and had them shipped back to Sydney. Cost all up was about $20. 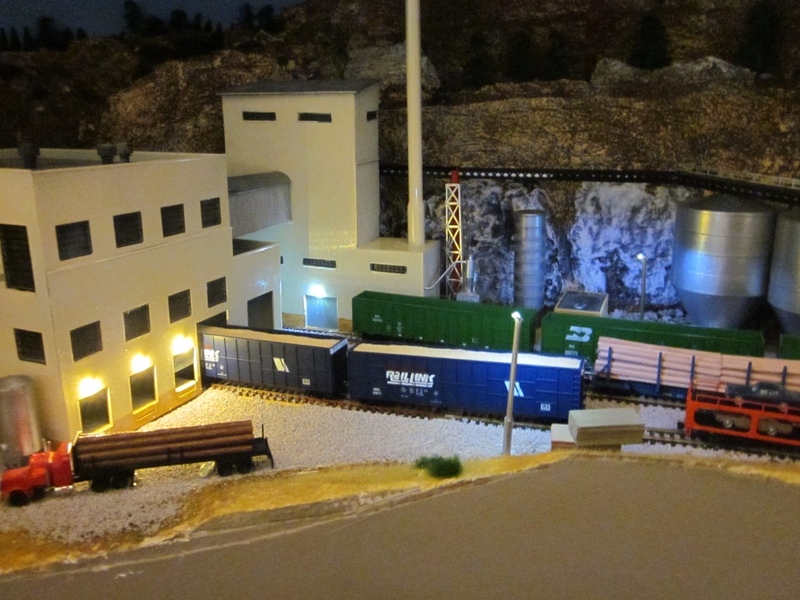 I proceeded to add lights to some of my buildings. Here are some examples. It is really quick and simple. I drilled 1mm holes for the leads in the buildings and inserted the SMD LED. Inside the building I attached the supplied resister and further leads to hook up to my 5 volt DC bus under the layout. I was impressed with the result for so little cost. The LEDs are so small they look like light fittings. 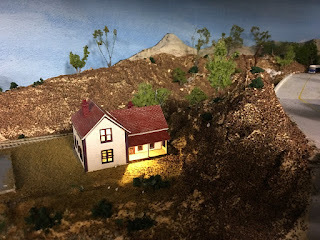 You can paint the tops to minimize upward light, but I find you can position the LED so the “globe” is downward. Look at these 3 building I did after Indianapolis. 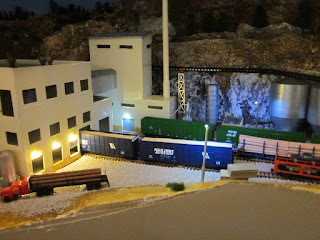 So after this effort I thought there may be a way to make realistic industrial lights. I used Google to get pictures and examples of contemporary lighting. Many industrial lights are a pole with a light box on top. Yeah, I know that sounds simple but go have a look. So the plan was to use plastic tube for the pole and a small section of channel on top as the light cover. The LED would sit in the channel. So here are the steps. 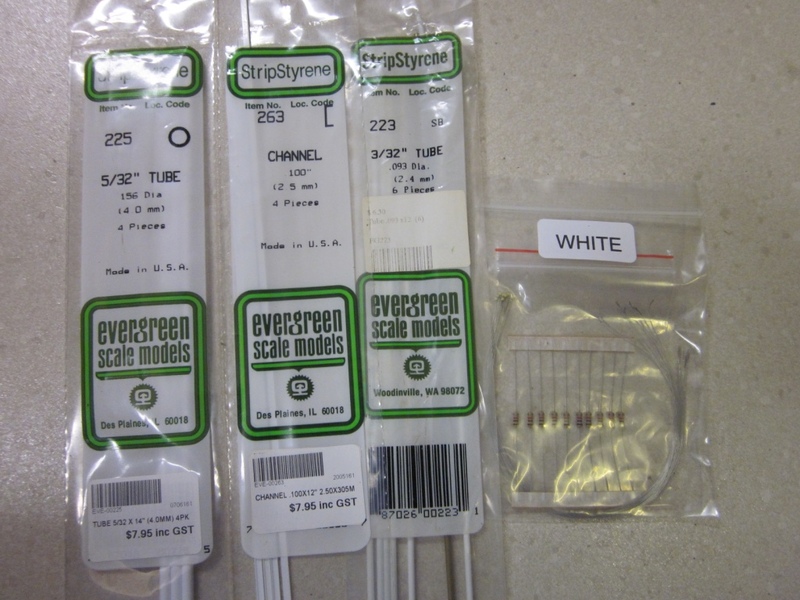 · Pole – Evergreen 2.4mm (3/32 inch) tube. 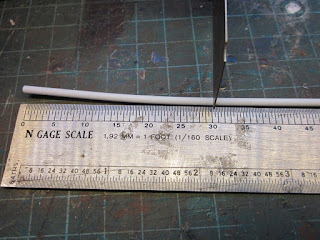 · Pole base: Evergreen 4mm (5/32 inch) tube. · Light: SMD LED – wired with resisters. · Paint: Aluminium spray paint..
After making my first light, which is the photograph on the first page, I decided to make a batch of 10 lights. Using a scale rule I made half 30 feet tall and the other half 40 feet tall. Next step is to thread the LED leads through the 2.4mm pole. 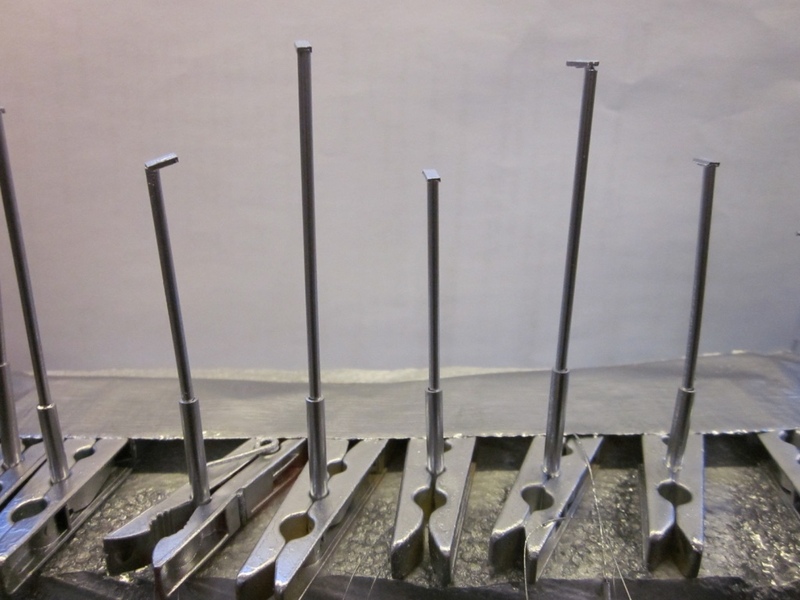 This is easy as the leads are very thin and there is plenty of room. Here are the 10 poles with LEDs. 99% of LEDs work but these industrial lights are not able to be maintained once built. Being LED they should last “forever”, but you don’t want a bad one at the finish. 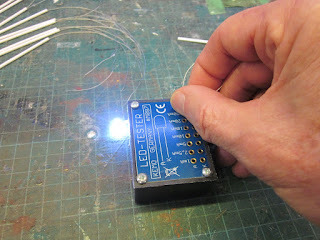 I use a simple LED tester but you could use a DC power source. 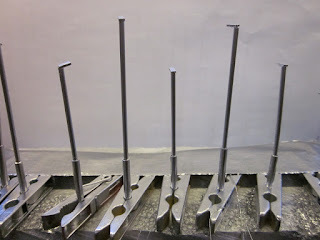 The base will go below ground level to give the pole more stability and it is also there to enhance it’s appearance. I cut the 4mm tube 2.5cm (1 inch) long and super glued it to the bottom of the pole with enough overlap to ensure a good fit. 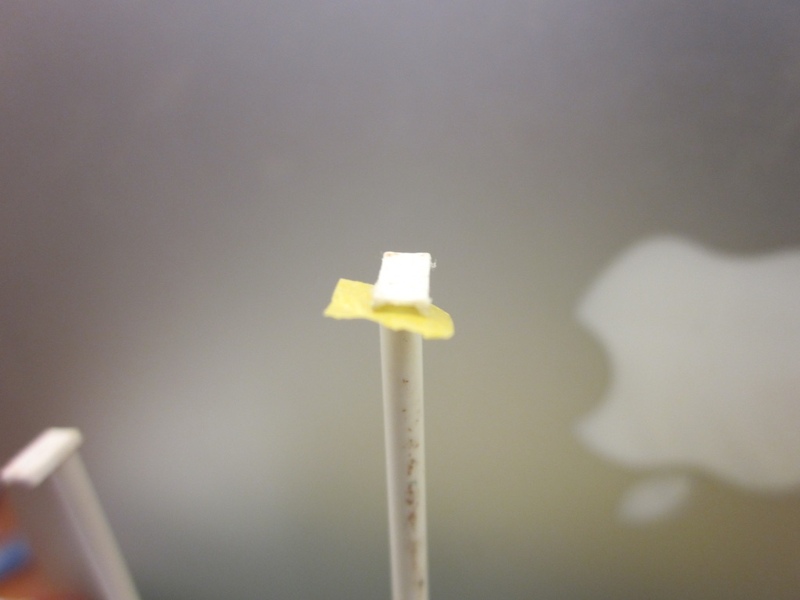 It is important to add the base at this stage as the resister and heat shrink may not fit through the base later. The top of the pole is a small section of channel to cover the LED and reflect the light downwards. Start with the first pole. Bend the LED so that it is just out of the pole and at 90 degrees to the pole. Then I add a little super glue in the channel (note a long piece of channel at this stage for stability) and force the pole into the channel with the pole at one end of the channel. Once dry in a minute or so you can cut the channel at the end of the LED and put the pole back in the holding Styrofoam. Then proceed to the next pole with more super glue in the channel. The LEDs come with resisters. There are two wires on the LED and one is longer than the other. Be consistent in your wiring as it helps with any later wiring issues. I solder the resister to the longest lead and then add a further lead and heat shrink the entire resister and connections at each end. 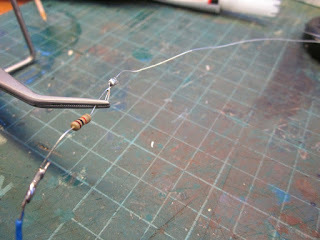 Then proceed to the other lead and after soldering add some heat shrink. At this stage it is prudent to test the LEDs again. I haven’t had a failure but better safe than sorry later. I painted my poles an aluminium colour using a cheap spray can. Before painting it is advisable to cover the LEDs with some tape. I use Tamirya masking tape but painters tape would work as well. 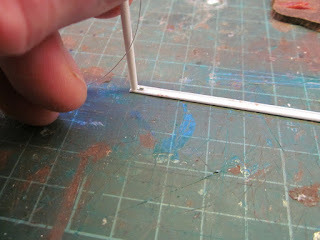 Cut small pieces and attach them to the bottom of the light. You could paint the poles by holding each pole by the lower base with a pair of tweezers or even your hand. 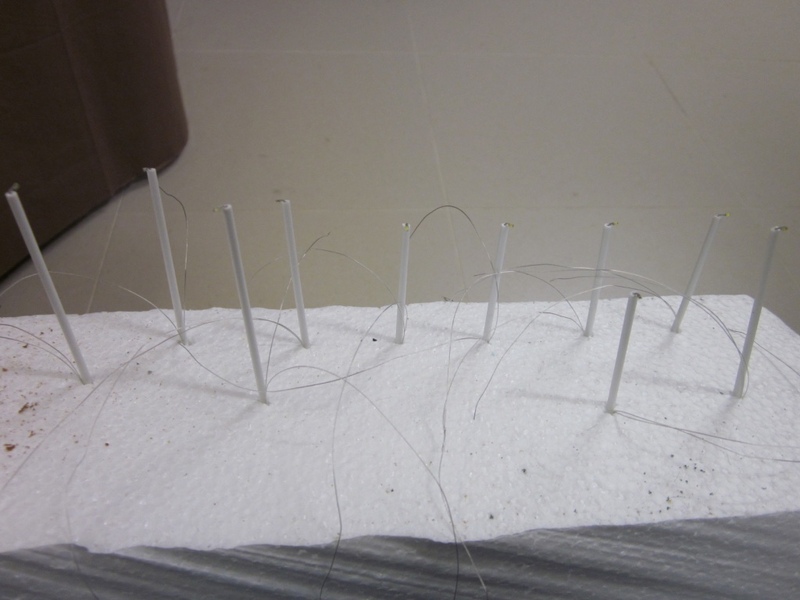 I used some clothes pegs to hold the ten poles and anchored them down with some gaffa tape. Mask the LED to keep paint off it. 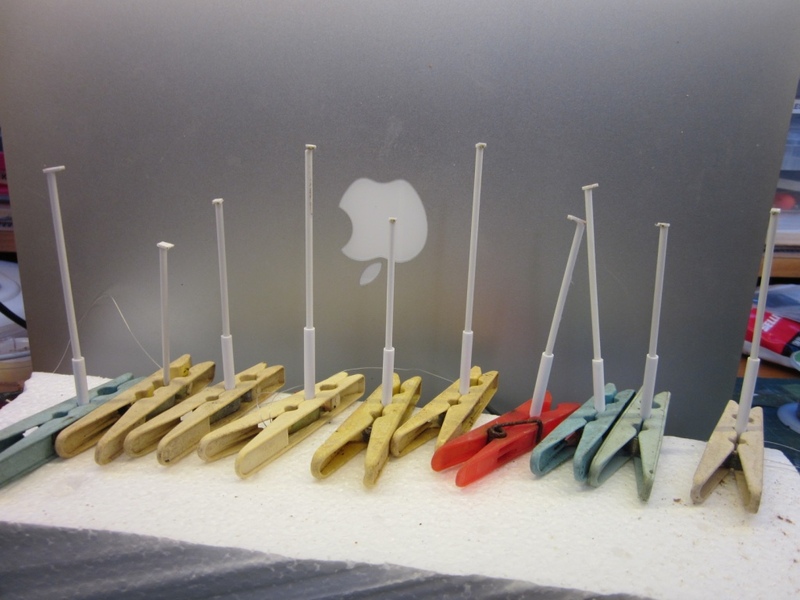 Here are the pegs holding the lights. 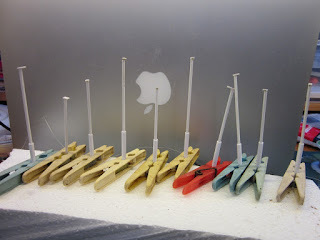 After painting and drying we have our ten poles ready to be installed on the layout.Yes, the pegs got paired as well. As the base is 4mm round that is the size hole you need to drill to install the lights. 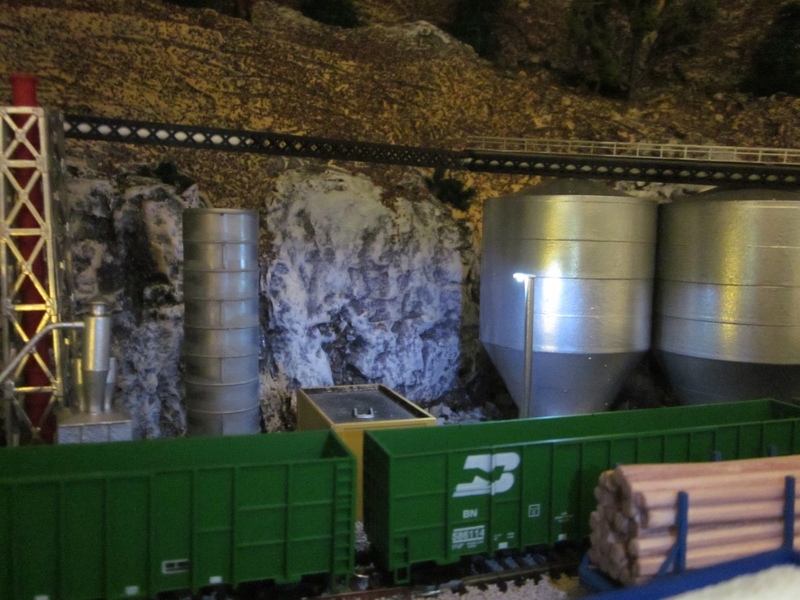 As mentioned, I have a 5 volt DC bus under the layout which is ample to power these lights. I attach all the short leads to one side of the bus and the long leads to an on-off switch on the fascia near the scene, which is then connected to the other side of the bus. One reason to be consistent with wiring is that if you used 2 colours to connect the LEDs (I used blue and white telephone cable), then all of one colour goes to one side of the bus and the other colour to the other side. I may find improvements as I do more lights and share ideas with fellow modellers, but I am very happy with the result. 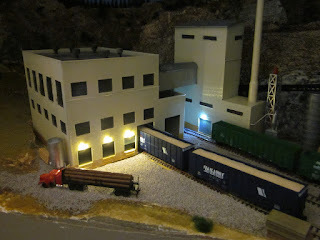 Here is the pulp mill with the industrial lights. Here is a close up of one of the poles at the pulp mill. Light pole at Pulp mill. Give it a go and share your experiences.